That’s why we make sure all our clients get a clear picture of how their finished project will look. We consider every client’s needs and vision for their space in detailed 3D design renders at absolutely no cost to them. Our three-dimensional basement designs help our clients identify the most optimal layout for their space. You can see how the space will look with different design elements before you commit to the project. 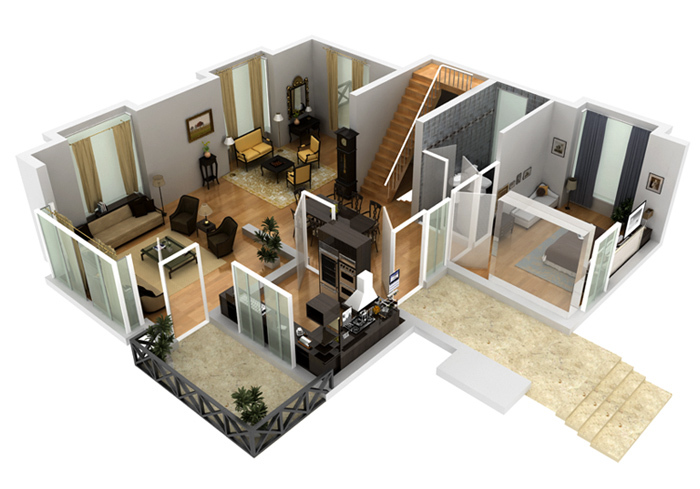 Our detailed 3D basement design layouts give us a chance to walk you through a computerized model of what the end result of your basement will look like based on the design options you’ve chosen. This gives you time to reflect and figure out if there’s a better way to optimize your space before we start the renovation. Another bonus is that the free 3D basement design allows you to orient yourself to the change so can start planning for how you’ll use the basement once the project is complete. We offer our basement design services for free as part of every basement project. They’re completed by professional designers who have years of experience designing basements and will be able to turn what you currently have into your dream space. Every design is customized based on your needs, layout, and the complexity of the project. Our designers use computerized (CAD) basement design software to give you a three-dimensional perspective of the basement finishing area. We think you’ll love what our designers come up with once you see your 3D design. But if you don’t, you can decide not to go forward with the project and still not pay us a dime.